Amy uses play therapy to help children process big emotions, develop social skills, and find solutions to social and emotional problems. She also works to help parents better understand and connect with their child. Amy has training in Cognitive Behavioral Therapy and Dialectical Behavior Therapy with children and teens. She is also passionate about helping adults heal from childhood trauma. Amy received her MA in Counseling from Gordon-Conwell Theological Seminary in Charlotte. She also holds a BS in Psychology, BA in Sociology, and Minor in Child and Family Development from The University of Georgia. 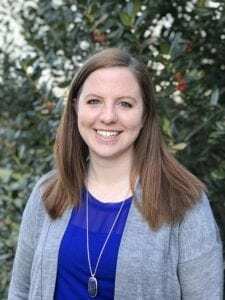 Prior to becoming a counselor, Amy worked as a high school teacher and enjoyed adapting her classroom for students with specific behavioral or academic needs. In her free time, Amy enjoys spending time with her family, running, trying new recipes, and all things Harry Potter.